Epoca Reserva will ship in six sizes: Corona, at 5 1/2 by 42 ring gauge; Gran Robusto, at 5 1/4 by 54; Inmenso, 7 by 56; Rothschild, 4 1/2 by 52; Corona Grande, 6 by 46; and Super Lancero, 8 by 38. 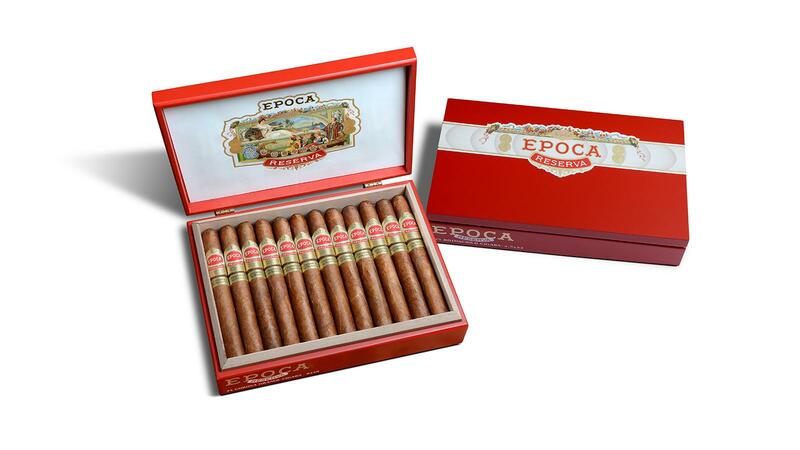 Nat Sherman International has repackaged and renamed its 1930 cigar brand as Epoca Reserva. The cigar debuted this weekend at the Tobacconists’ Association of America conference in the Dominican Republic, alongside the Nat Sherman Timeless 2019 TAA Limited Edition. Unlike the Timeless 2019 TAA, which is a cigar only available to TAA retail members, Epoca Reserva will be available to all cigar retailers. Epoca Reserva is a line extension and does not replace the company’s already existing Epoca cigar line, which will go unchanged. The tobacco blend and vitola sizes of Epoca Reserva will remain the same as when it was called Nat Sherman 1930. The cigar is rolled with a Dominican wrapper and binder and filler tobaccos from Nicaragua and the Dominican Republic. The cigar comes in six sizes: Corona, at 5 1/2 by 42 ring gauge; Gran Robusto, at 5 1/4 by 54; Inmenso, 7 by 56; Rothschild, 4 1/2 by 52; Corona Grande, 6 by 46; and Super Lancero, 8 by 38. The cigars are packaged in 24-count boxes, save for the Super Lancero, which ships in 10-count boxes. Epoca Reserva is priced $9.95 to $17 per cigar and is slated to ship to retailers in late spring. Last year, Nat Sherman restructured its premium cigar portfolio by redesigning and renaming the majority of its cigar brands for a more modern appearance. According to Herklots, relaunching Nat Sherman 1930 as Epoca Reserva was the final piece of the puzzle. “This is the final step in the brand realignment project we successfully executed in 2018,” Herklots said.